Join Luke Skywalker, Han Solo, Chewbacca, Yoda, Princess Leia, Darth Vader, and more in Star Wars Galaxy of Adventures, a new series of animated shorts celebrating the galaxy far, far away on November 30, 2018! Also, be sure to visit Star Wars Kids at http://www.starwarskids.com. Enjoy! So you haven't got the Disney Channel or you haven't yet watched an episode of Star Wars Resistance? Now is the time! Watch the first full episode entitled "The Recruit" and watch Star Wars Resistance every Sunday at 10:00pm ET/PT on Disney Channel. Enjoy! My good friend Mark has sent over his latest episode of Making Tracks! Right now the galaxy of Star Wars is busier than the Hydian Way and more action packed than the Geonosis Arena, and Fantha Tracks are right at the centre of it. On the 14th episode of Making Tracks, Mark and Dave talk the live action Cassian Andor series, Matt Booker catches up with Marvel writer Kieron Gillen, Mark presents the third and final part of his chat with the legendary Greg Hildebrandt, talks LEGO with author Rhys Knight at LEGO Day Fordingbridge and we listen in to Fantha Trackers at NYCC. Take a deep breath and dive into the latest Making Tracks. 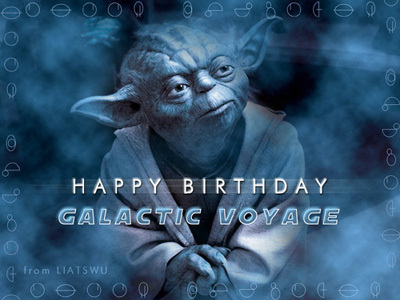 Today we celebrate Galactic Voyage's 19th Anniversary! Thank you for making Galactic Voyage one of your Star Wars destinations over the years! We are all looking forward to Star Wars Celebration, Episode IX, The Mandalorian Live-Action Series, The Cassian Andor Live-Action Series, Star Wars Resistance, the return of The Clone Wars, the latest new Star Wars game and so much more on the horizon. It looks to be another action packed year! What a great time to be a Star Wars fan! "You've taken your first step into a larger world!" This week on The Star Wars Show, the voice of Hype Fazon, Donald Faison, takes over as the voice of the Yoda fountain and stops by to talk about his namesake ace pilot in Star Wars Resistance. Plus, we celebrate the return of Diego Luna in a Disney+ series about Cassian Andor, Lenovo's Star Wars: Jedi Challenges joins the dark side so you can fight like Kylo Ren against Rey and Yoda, and more! Enjoy! Tam confides in a new friend in this clip from "Synara's Score." Watch Star Wars Resistance every Sunday at 10:00pm ET/PT on Disney Channel. Enjoy! The Star Wars Show - Cassian Andor Live-Action Series Announced! Cassian Andor is getting his own live-action streaming series on Disney+, and Diego Luna is returning to the role! Another new Star Wars show to get excited about! Enjoy! This week on The Star Wars Show, the voice of Neeku, Josh Brener, stops by to talk about becoming part of the galaxy in Star Wars Resistance. Plus, ILM's Rob Bredow prepares to join us for Star Wars Celebration Chicago, Andi and Anthony explain how to cast your ballots for the Audience Choice award in the Star Wars Fan Awards 2018, we take a closer look at a porg and other props in the Lucasfilm display case, and more! Enjoy! Kaz joins Poe Dameron to help a ship in need in this clip from "Signal from Sector Six." Watch Star Wars Resistance every Sunday at 10:00pm ET/PT on Disney Channel. Enjoy! This site is not connected to Disney or Lucasfilm Ltd. in any way. Any improper use of Lucasfilm's copyrighted material or trademarks on this site is not intended. Do not reproduce or copy any material or ideas without authorization from the Webmaster. All rights for Star Wars © 1977, 1997, 2004, 2005, 2006, 2011; The Empire Strikes Back © 1980, 1997, 2004, 2005, 2006, 2011; Return of the Jedi © 1983, 1997, 2004, 2005, 2006, 2011; The Phantom Menace © 1999, 2011; Attack of the Clones © 2002, 2011; Revenge of the Sith © 2005, 2011; The Clone Wars © 2008, 2009, 2010, 2011, 2012, 2013, 2014; Star Wars Rebels © 2014, 2015, 2016, 2017, 2018; The Force Awakens © 2015, Rogue One © 2016; and The Last Jedi © 2017 are reserved by Disney and Lucasfilm Ltd.